The waters of the world have been turbulent lately, to put it mildly. Into this sea of uncertainty cruises a fleet of smaller, more affordable trawlers. 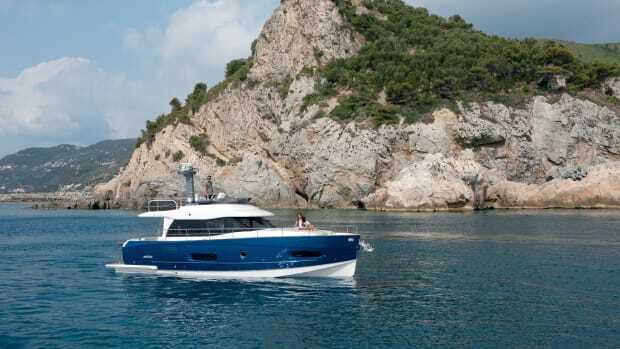 Although the concept of compact trawlers is not new, this category of boats has been growing rapidly, no doubt because it offers cruising contentment at a lower price in these tumultuous times. Over the years we’ve featured many of these compact boats, such as the Devlin 26 pictured here, in PMM articles, and there will be more stories to come. On the following pages we offer a guide to many of the boatbuilders in the United States, Canada, the Caribbean, and Europe that are providing their unique versions of the pocket cruiser. Some of these builders have been at it a long time; others are brand new to the market. One of the more familiar names in the cruising trawler niche, Nordic Tugs, recently reintroduced its venerable 26-footer, the model with which the company got its start almost 30 years ago—further evidence of the increasing popularity of smaller vessels. So put on your boat shoes, head for the shows, and have fun kicking tires—after all, you’ll find many of these compact cruisers right at home atop their trailers. 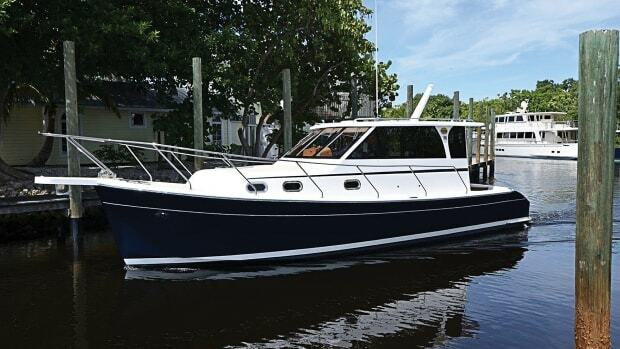 Atlas Boat Works, located in Cape Coral, Florida, builds the Acadia 25, based on traditional lobsterboat lines. Father-and-son team Stan and Tom Gamso have built 180 Acadia 25s since 1987. Now, with Tom’s sons helping, the company has three generations of builders working together. The Acadia is powered by a single Yanmar common-rail diesel with a variety of horsepower choices, offering cruising speeds of up to 20 knots. The boat displaces 5,100 lb. and has an extensive list of standard equipment. Custom trailers are available. Her interior features a standing-headroom cabin with head and shower, and there’s lots of cherry wood trim for a traditional look. If it’s tradition you want, how can you beat the combination of Downeast design and family togetherness at Atlas? For more information, visit www.acadia25.com or have a chat with Tom or Stan at 239.574.2628. The AeroCat 27, one of the newest entrants in the pocket trawler category, is built by AeroCat Marine, located in a suburb of Erie, Pennsylvania. AeroCat has been building small multihulls for the last two and half years. Partners Terry Olsen and Ken Handman saw an increasing interest in compact trawlers and subsequently designed the AeroCat 27, which offers the stability advantages of a multihull configuration. Their boats are assembled from pressed panels, as opposed to molds, allowing a great deal of flexibility in size and layout. A custom trailer is available, and the boat can be powered with an outboard or an optional Cummins MerCruiser Diesel 150hp I/O. Cruising speeds from 15 to 20 knots are typical, depending on the engine power and equipment specified. Learn more at www.aerocat boats.com, or call Terry at 814.602.9286. From Nova Scotia comes the Aylward 25, produced by Aylward Fibreglass in Barrington. Aylward has been building commercial and pleasure boats for more than 20 years and in 2006 was recognized as the first boatyard in Atlantic Canada to use resin infusion to mold complete hulls, resulting in lighter, stronger components. The Aylward 25 is powered by a 200hp Yanmar diesel that provides a top speed of 20 knots. 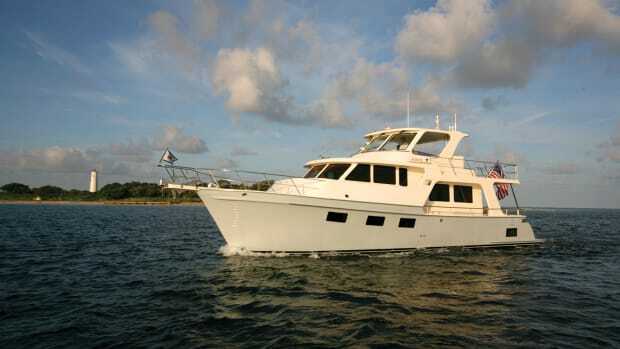 Standard equipment includes many features found on full-size trawlers, such as an electric head, a hot-water heater, shorepower, and a sliding privacy door between the saloon and the V-berth cabin. Visit www.novatrawler.com or call Charlie Arcon at 902.875.1276 to learn more. Another Canadian design, the Caledon 25, is outboard powered and features an unusually low center of gravity while still allowing 6 feet 5 inches of headroom in the saloon. The Caledon 25 has been in production since 2001, and the Villmann family, owners of Caledon Boatworks, has been building boats for more than 30 years. They pride themselves on their craftsmanship and construction, which features a solid, handlaid-up glass hull, PVC core in the deck and topsides, and a fully bonded hull-to-deck joint. 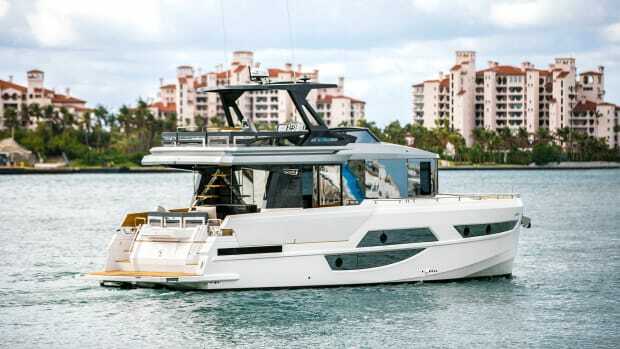 The new 27-foot version pictured here includes a stern extension, as well as a cabin that’s 2 feet longer, allowing space for a roomier galley and a stand-up shower. To find out more, browse www.caledonboatworks.com or call Richard Villmann at 519.940.4493. St. Martin in the French Antilles may seem an unusual place to find a trawler builder, but that is in fact the birthplace of the ocean-capable Mayrik P214. Mayrik Yacht Design builds and markets a wide range of vessels designed by naval architect Yves Kinard. His concept for the P214 was to provide trawler-style accommodations in a 21-foot boat that would be safe in any conditions. The mini trawler’s hull incorporates a bulbous bow for a smoother ride in head seas. Finland has long been known as a home to quality boatbuilding, and the Minor Offshore 27 and 31 are fine examples of this tradition. Minor Offshore, a leading builder of commercial patrol and rescue boats in Europe, builds its all-weather yachts to the highest standards. Skarne Marine is the exclusive importer of Minor boats to the United States and has had a great reception at recent boat shows. Minor’s mini yachts feature a deep-V hull, inboard/outboard Volvo engines, and a unique saloon with seating for six. The 27 and 31 have 9-foot-plus beams, so they are trailerable only with a towing permit, but a new 25-footer with an 8.5-foot beam will be available soon. For a closer look at Minor Offshore boats, browse www.skarnemarine.com or www.minor.fi. Carl Skarne is available at 203.283.5300. 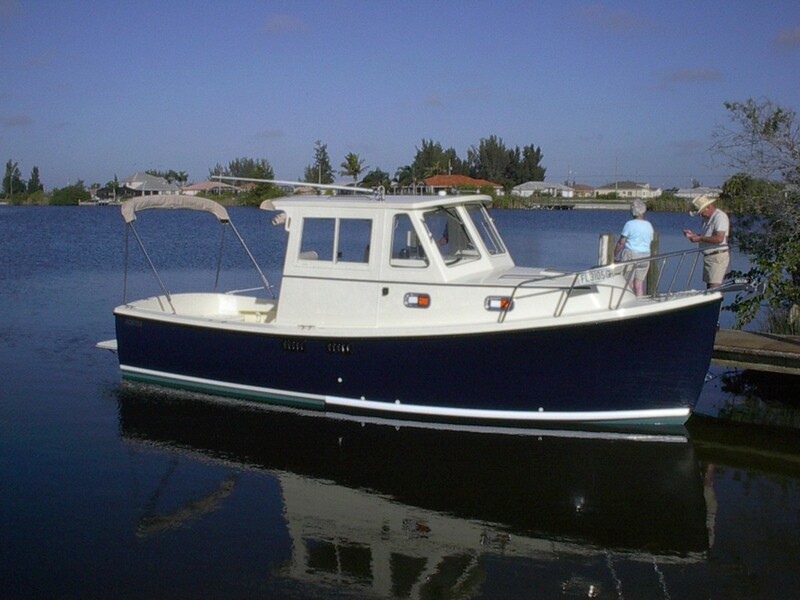 One of the first compact trawlers ever built, the Nomad 25, is still being produced in Brandon, Florida, by Nimble Boats. Builder Jerry Koch collaborated with Ted Brewer on the design of the 25 and began construction on the first hull in 1990. The Nord Star 31 is rated as a Class B offshore boat by the IMCI (International Marine Certification Institute), a prestigious designation that speaks to the boat’s performance capability. She features three entrance doors to the main saloon and two sleeping cabins. Nord Stars are built in Finland by Linex-Boat Oy, a family-owned company that has constructed more than 3,000 boats, many of them rescue vessels. In 2008, the firm opened a new state-of-the-art manufacturing facility. John B. Uljens, president of Nord Star USA, says, “We were impressed by the comfort of the Nord Star, and its remarkable seaworthiness and tremendous fuel economy.” John, who can be reached at 877.833.1219, also imports 24- and 26-foot Nord Stars. Browse www.nordstarusa.com to learn more. The 2009 reintroduction of the Nordic Tug 26—the boat that put Burlington, Washington-based Nordic Tugs in business—speaks volumes about the new popularity of compact trawlers. Born out of the mid-’70s fuel crisis, the NT 26 was launched at the 1980 Seattle International Boat Show. An astounding 54 boats were sold in the first week. 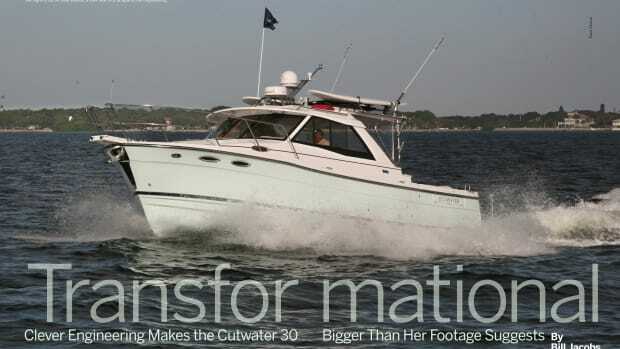 Production of the boat ceased in 1998 as larger models became more popular, but now the 26 is back. Her 9.6-foot beam means she’s trailerable with a towing permit, but owners will appreciate that she shares the quality construction of her larger sisterships and carries a hull warranty of 10 years. The tug’s 110hp Volvo diesel allows her to reach a maximum speed of 14 knots. Check out Nordic Tugs’ informative website (www.nordictugs.com) or call 800.388.4517 for more details. North Pacific Yachts was founded in 2004 and since then has built more than 50 boats. Owners Trevor and John Brice started with a 43, introduced a 39 in 2008, and were completing hull number 1 of the North Pacific 28 as this article was being written. Trevor found the boat’s design, by Karl Stambaugh of Chesapeake Marine Design, in the pages of PMM, and the two worked together to make the North Pacific 28 a reality. This small trawler’s construction features are similar to those of North Pacific Yachts’ larger models; the boat is being built at the same China plant using vinyl ester resin, Nida-Core, and name-brand components. The 28 is equipped with a 130hp Cummins QSD engine and is trailerable without a permit. Call Trevor Brice at 604.377.6650 or visit www.northpacificyacthts.com for more information. Nova Scotia is surrounded by the sea and populated by boatbuilders. James Rosborough, who founded Rosborough Boats Ltd. in 1955, is one of those builders. Still going strong after more than 50 years in the marine industry, the company builds both workboats and pleasure craft. The Rosborough 246 is one of the original trailerable trawlers, with more than 430 boats sold; 45 of them are in service with Fisheries and Oceans Canada, patrolling the harsh North Atlantic. The 246 Sedan Cruiser is currently being offered as a package that includes such features as a solid roof extension over the cockpit, a three-battery system with charger, and 100 percent positive flotation. The boat is available with single or twin outboards, or with a diesel or gas inboard engine. To learn more, visit www.rosboroughboats.com or call 902.450.3262. A majority of the vessels mentioned here are trailerable without a towing permit. Trailerability can be a very desirable feature, because it gives you a much broader cruising range. The maximum beam measurement for trailering without a permit is 8 feet 6 inches. 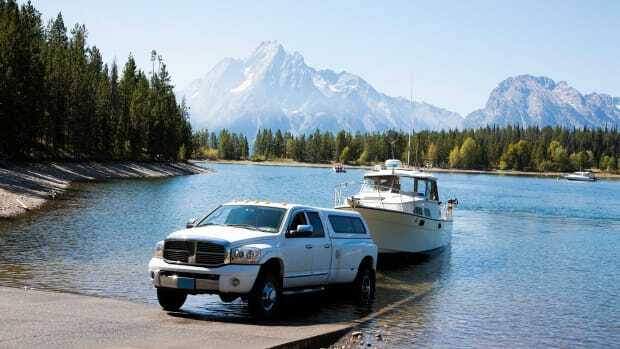 But the width of your boat is only one aspect to consider when you’re thinking about towing. Just as proper equipment, training, and experience are essential when cruising on the water, they’re also essential when cruising down the highway—perhaps even more so, as the boat are her skipper are out of their natural element. Trailering could easily be the subject of an entire article, and the topic is beyond the scope of this overview of compact trawlers. Still, it’s important to review a few key points to keep in mind when trailering a boat. Safety is the primary issue. Most of the boats discussed here are at or near the upper weight limits for recreational trailering. These boats also are greater in height, have a higher course over ground, and are longer than most towed boats—all of which places an even greater emphasis on careful selection of the road components. The trailer, the attachments, the braking system, the hitch, and the towing vehicle all play key roles in a safe and roadworthy package. An equal amount of time and effort should be invested in selecting and purchasing the aforementioned equipment as would be spent choosing your boat’s engine, electronics, and marine safety gear. Good resources for advice include the boat manufacturer or dealer, automobile and truck dealers, and the Internet. An excellent place to start on the web is www.boatus.com/trailerclub; under “Trailering Laws,” you’ll find a state-by-state summary of trailer regulations and contact numbers for boating law administrators.